TH E M R EP O RT | 33 Special Advertorial Section COMPLIANCE COMPANY INDEX KEY PERSONNEL Walt Coats Founder & CEO Kevin Lombardo President Paul Bina SVP, Business Development STAFFING Employees: 25+ CONTACT INFORMATION 8700 Turnpike Drive, Suite 318 Westminster, CO 80031 Phone: 720.229.1990 Email: info@centricllc.com Web: CentricLLC.com Centric Technology Solutions Corporate Profile Centric Technology Solutions, LLC's valuation and appraisal management software maximizes compliance throughout the valuation process. Centric's web-based solutions are fully-customizable and enable compliant reporting, in-depth analysis, diversified high-quality data, and risk mitigation for appraisers, lenders, quality reviewers, AMCs, and other valuation industry users. Centric's valuation platform has been shown to: • Reduce training time by 60 to 80 percent • Improve quality and accuracy by 30 to 50 percent • Reduce the number of review cycles • Improve turn times by 30 to 40 percent • Reduce costs for review and reconciliation, along with the maintenance of multiple software applications If you'd like to see similar results, contact Centric today to book a demo. Centric aims to be "At the Center of Solutions for Quality, Efficiency, Control and Visibility." Company History Founded in 2011 by real estate and valuation industry veteran Walt Coats, Centric was established to modernize and improve the way the industry works by leveraging technology. Since then, with the help of industry leaders and veteran valuation experts, Centric has built a suite of innovative tools for risk mitigation and compliance. Centric Product Suite Centric's valuation platforms, data integration, and tools can be rapidly customized and configured to meet any standard, regulation, requirement, or business need. Platforms & Products • Centric CVP™ for Appraisals manages the entire appraisal life cycle with integrated guidance and enforcement of standards and rules. • Centric CVP™ for BPOs offers the most intuitive and effective method of managing, producing, and delivering valuation reports. • QualityEdge™ review software and scorecards help measure rule compliance, comp quality, and reliability of values. Data & Tools • Integrated Data uses MLS data, county records, and other data sources to score comps and provide an estimated "soft value" in support of the appraisal. • Business Process Management provides custom software configurations that work the way you do. 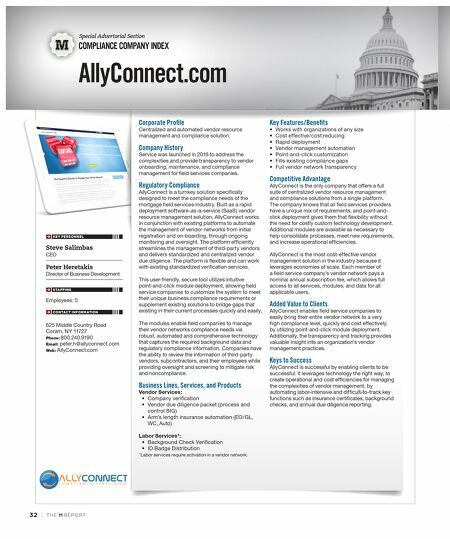 • Appraisal Reports feature integrated USPAP guidance for fully-compliant 1004 reports. Key Features/Benefits The CentricCVP™ for Appraisals and CentricCVP™ for BPOs collateral valuation platforms bring users together in unified, securely partitioned, data-aware marketplace solutions. Unified workspaces and guidance ensure that regulations and requirements are understood by users throughout the workflow, promoting consistency, quality, and compliance. The collateral valuation platforms provide these advantages in consistency and compliance: Centric CVP™ for Appraisals leverages robust data, embedded USPAP guidance, and rapid configuration of new rules and lender overlays that keep appraisers, lenders, and AMCs current and compliant with changing regulations, data standards, and variable client requirements. Centric CVP™ for BPOs provides embedded lender rules, customizable guidance, and flexible, rapid configuration of rules, forms, and products that help all users stay compliant. QualityEdge™ Web-based software uses a powerful rules engine to help reviewers analyze appraisals against robust data sets and custom rules, as well as government regulations, USPAP rules and standards, client guidelines, and lender requirements. Hosting options include Software-as-a-Service (SaaS) technology and locally-hosted solutions for organizations with stringent security requirements. 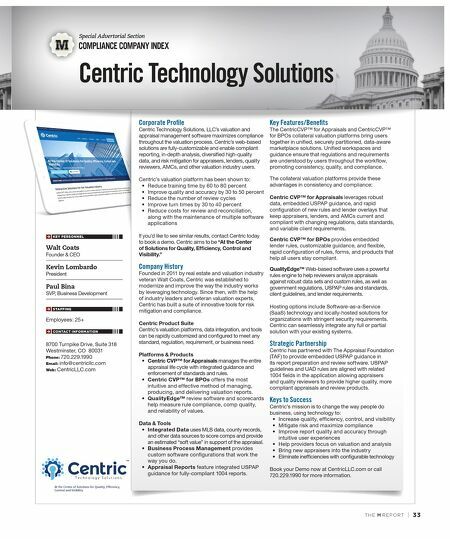 Centric can seamlessly integrate any full or partial solution with your existing systems. Strategic Partnership Centric has partnered with The Appraisal Foundation (TAF) to provide embedded USPAP guidance in its report preparation and review software. USPAP guidelines and UAD rules are aligned with related 1004 fields in the application allowing appraisers and quality reviewers to provide higher quality, more compliant appraisals and review products. Keys to Success Centric's mission is to change the way people do business, using technology to: • Increase quality, efficiency, control, and visibility • Mitigate risk and maximize compliance • Improve report quality and accuracy through intuitive user experiences • Help providers focus on valuation and analysis • Bring new appraisers into the industry • Eliminate inefficiencies with configurable technology Book your Demo now at CentricLLC.com or call 720.229.1990 for more information.